Stop the presses! Sometime in June 2007, José Carlos García photographed this cuckoo near Río Mono on the Bayano. 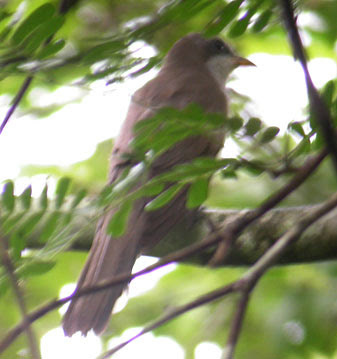 It was originally reported as a Yellow-billed Cuckoo, which would have no business in Panama during the boreal summer, but as it clearly was neither Dwarf, Dark-billed or Gray-capped Cuckoo, the three species of South-American vagrants previously recorded in Panama, the local consensus was that it was safer to call it a Mangrove Cuckoo and move on. Pearly-breasted Cuckoo (Coccyzus euleri) may be a better candidate for this bird. Pearly-breasted Cuckoo is an austral migrant that looks more or less like a Yellow-billed Cuckoo but with no rufous in the wings and gray eye ring instead of yellow. Although the eye ring is hard to see, there is no indication of yellow in this image. The bird in the image also shows light gray on the throat lacking the buff tones of Mangrove. Upperparts also look to be darker brown than the grayish brown of Mangrove. Pearly-breasted Cuckoo has never been recorded in Panama, and is "very local and scarce in Colombia, Venezuela and Guianas. Presence erratic and unpredictable." Googling Pearly-breasted produces two photos, one in flickr and one at the IBC, both showing what basically looks like a Yellow-billed.